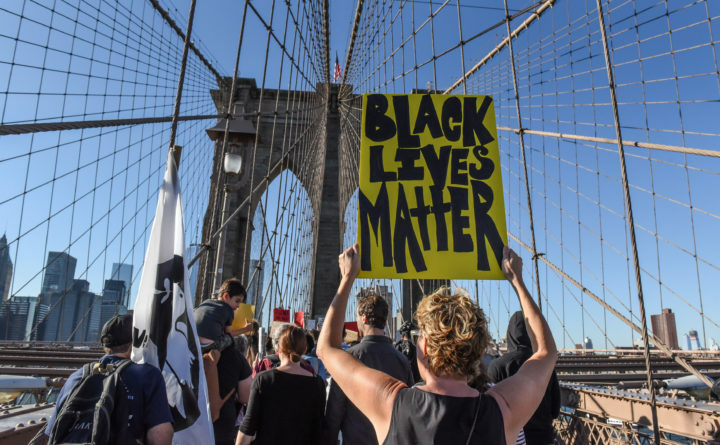 A person carrying a Black Lives Matter sign participates in a protest called March for Racial Justice while walking over the Brooklyn Bridge in New York City, Oct. 1, 2017. Writing about racism as a white person is complicated. I benefit from whiteness. When I write about racism, rather than getting death threats — like so many people of color do when they write about racism — I tend to get lots of “cookies” or kudos for my courage. So, I’m in a bind. I don’t want praise for doing something that poses very little risk for me. I’m protected by whiteness. The voices of people of color are the ones we should be listening to. That said, I believe it’s my responsibility as a white person to talk to other white people about my experiences related to racism. I do this in the hopes that others might benefit from my experience and so I can continue learning. I am directing this column to my white readers. In college, I joined a group called the Society Organized Against Racism. In group discussions, I cried a lot. I felt overwhelming guilt about being a white person when white people have done so much harm, from our participation in systemic racism like slavery and segregation to everyday racist acts like job discrimination or bias in our schools. I wanted the black and brown members of the group to help me be a better white person. I see white people doing this a lot these days. I didn’t realize then that asking people of color to help fix me was centering on whiteness. I wasn’t doing the work myself; I was asking them to do it for me. Flash forward a decade or so, and I had grown some. I read a lot about racism. I learned quite a bit from books. I didn’t feel guilty about being white, though I had an even stronger sense of responsibility to try to help fight racism. My life was still pretty much filled only with white people, but I had started doing some work by trying to educate myself through the small effort of reading. Flash forward another decade. My focus moved inward. I began facing how personally uncomfortable I was interacting with people of color. Me? A well-meaning white liberal? Impossible! I’ve been fighting racism since college! But it was true. I couldn’t figure out why, but when I was around people of color, I’d feel this freaky nervousness. Almost a hyper-awareness of everything I said or did. I’d constantly monitor every word that came out of my mouth, trying to judge whether or not I was being racist. I see now how that anxiety made me avoid situations where I might interact with people of color. I had to recognize my own problematic internal responses before I could begin changing them. Recently, I was leaving a store in Oxford County, and I saw two men who looked like they might have been Middle Eastern. Do you know what I thought? “I wonder if they’re terrorists?” Do you know what I did with that thought? Instead of spending all kinds of time condemning myself for disgustingly racist thoughts, I just let the thought flow through lightly. It’s not always easy to explain this, because I don’t think it’s good that I thought “terrorist.” But until I was able to accept that I’m influenced by implicit bias — to recognize the vile thoughts that flash through my mind without my even realizing it beyond a gut-level uncomfortable feeling — I wasn’t able to get rid of them. These days, being with people of color doesn’t freak me out. I may still have some barely perceptible absurd and racist thoughts, but they flash through so quickly they don’t get in the way of my speaking with people as people. It’s not at all that I “don’t see color.” It’s that my concern with myself is a lot less. Most of the time, I’m not distracted by trying to be not racist. As I continue the process of acknowledging, accepting, and letting go of my nearly-subconscious racism, I am guided by leaders like the Rev. angel Kyodo williams’ work. Rev. williams, co-author of “ Radical Dharma: Talking Race, Love, and Liberation,” will be speaking at Bates on Nov. 13. Acknowledging and then practicing acceptance of my own personal thinking problems has helped me enormously. Now that I’m comfortable being a human being with other human beings, regardless of our apparent differences, I feel much more sure that I can be of use in the real work that needs to be done to restructure our country on foundations of solidarity and justice rather than the racist structures on which it is currently built.